The Good side of ECM data recordings. Pictured below is an actual example of an ECM download. Do not confuse this with OBC or GPS systems. The ECM is the Engine Electronic Control Module. It is what most of you call "the Computer". The ECM has a wealth of knowledge for maintenance and engineering personel. Though a source for controversy, the data downloaded from the ECM is critical for troubleshooting procedures. This was a driver report of weak brakes. The thin vertical line you will see in all pictures is the time of "the incident". Which was 9:11, EST. The incident in this example was a hard brake application. Here you see the Vehicle Speed. The maximum speed was about 41 MPH, approximately 2 seconds before the incident. For about the first minute before the incident, the speed is up and down 0 and 15 mph over and over. Indicating the vehicle is in traffic. 20 seconds before the incident, the vehicle steady speeds up to the mas speed of 41. Then the incident, a hard brake application, and the vehicle is brought to a complete stop in less than 3 seconds. This is not a braking issue. It is an example of an operator overdriving the exit ramp. With this information, maintenance now knows that this brake system is safe for our customers. It was insepected and released for service with no other issues. Below is the Engine RPM's. notice again, up and down at first, in traffic. 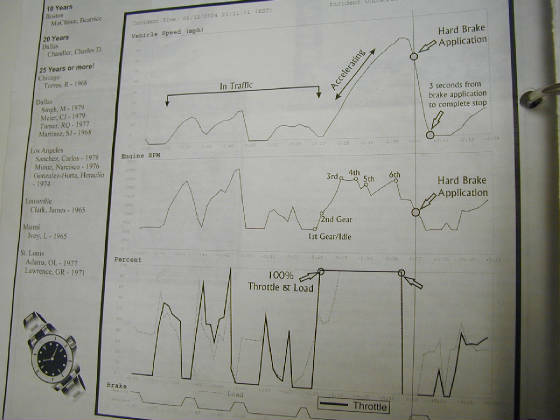 then a steady progression thru the gears, up to 6th, then 5 seconds before the incident, they drop, indicating the driver has removed his foot from the throttle and is reviewing the situation. Once again, up and down in traffic, then 100% throttle (full throttle) to 0% throttle 3 seconds before incident. In an incident resulting in the death of a law enforcement officer in Tennessee, the authorities came to very different conclusions about what happened in this accident, quite contrary to a witness statement and what the data recorder on the engine recorded. Governed speed of the truck as identefied by the ECM and brake activity by the driver as recorded by the ECM appear to tell a different story from that of the authorities. Unfortunatley, while people argue the legality and validity of ECM recorded data, this driver sits in jail with bail set at 3 million dollars.